Thirty years ago, today, last students graduated from St. John Kanty Prep in Erie, PA. Although enrollment for school year 1979-1980 was highest in school’s history (202 men) the graduation ceremony on June 8, 1980 was the last one. There were various reasons leading to this sad and sorrowful moment, generally, lack of funds and staff. Despite its closing, for next decades St. Kanty Prep stayed in its place. And those driving down or up East 38th Street in Erie could take look at characteristic building. And now, when you are on East 38th Street you cannot see John Kanty anymore. Bulldozeers demolished the edefice completely to ground during month of April. When the last wall came down, the legend came to the end, too… From now on it only will remains in memories of the Kanty Alumni and Erie people. History of St. John Preparatory began in 1909. On occasion of the mission in St. Stanislaus Bishop & Martyr in Erie, PA Vincentian priests conducting the mission – Fr. George Glogowski CM, Fr. Paul Waszko CM, Fr. Anthony Mazurkiewicz CM and Fr. Joseph Slupina CM supported Erie pastor, Fr. Andrew Ignasiak (later Monsignor) in the idea of founding Polish school providing college preparatory education for children of the immigrants. Erie and Great Lakes region were chosen for the location because of two main railroads New York Central and Pennsylvania Railroad crossing their tracks here. It guaranteed good communication for most of the cities in North Eastern US. On June 29 they founded St. John Kanty College Association. Its main purpose was to acquire land and location and build the boarding school. First meeting of the Association’s board took place on October 29, 1909 (feast of St. John Kanty in late liturgical calendar) and decision for location of the school was chosen then. The Association agreed to build the school on the land acquired on Cooper Road no later than on January 1, 1910 and to accept students for one class at a time until there will be five classes (the Polish university preparatory system). 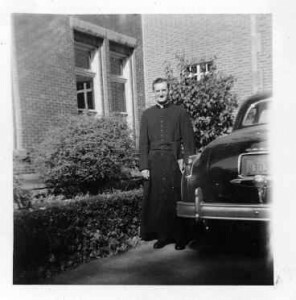 Francis Palecki (1897 – 1984), later Monsignor and Pastor of St. Adalbert Church, Philadelphia was the first student to register. He was also the first to graduate after five years, the final recognized by many colleges as the first year of Junior College. On Memorial Day, May 30, 1911 at 4:00 PM during the special ceremony carried out the cornerstone of new building was laid by His Excellence John Edmund Fitzmaurice in the presence of many state and religious oficials. The ceremony lasted until 6:00 PM and most of the attendants stayed there till the end. The large fire proofed building was of magnificent proprtions, being no less substantial than beautiful. The dimensions were: front 180 feet; end wings 106 feet each; all three stories hihg reaching about 60 feet to the tip of the cross, crowning a golden dome. First and second stories were 12 feet, the third 15 feet high. Intended for finve stories originally, it was finished off at the third floor to minimize the cost. Equipped, it represented and investment of at least $125,000 and was designed for 300 students. The statue of the patron saint, St. John Kanty, above the main door was hand carved of Carrara marble. made in Milan, Italy. Its height was six feet and seven inches and weighs approximately 1,800 lbs. A Polish eagle, exquisitely carved in stone by unknown artist was immediately below it. 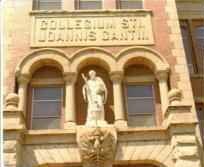 On February 3, 1992 it was brought to St. John Cantius Parish in Philadelphia, PA, through the efforts of Msgr. Bernard E. Witkowski, Pastor of St. John Cantius and an Alumnus of Kanty’s class of 1953. The expense of removing the statue and transporting it to Philadelphia was covered by the generosity of the Alumni. The chapel, capable of seating 300 people was on the third floor directly oabove the library room. Three altars graced the chapel, of which the main one was the Blessed Virgin Mary’s altar and the side altars dedicated to St. Joseph and to St. Vincent de Paul, for whom the chapel was named. The chapel was completely furnished by a special donation from parishioners of St. Stanislaus in Erie. Labor Day, September 2, 1912, was memorable day in Catholic educational circles around Erie. On that day, St. John Kanty College was dedicated. At the conlusion of the ceremonies, the Rev. Andrew Ignasiak, president of the Association, submitted a financial report to the board of directors. The board members all resigned in favor of the Vincentian Fathers, as per motion of November 20, 1912, and henceforth, only the Vincentian Community members comprised the governing board. Fr. George Glogowski CM became the first rector of St. John Kanty College and Prep School. He hold the position until his sudden death on February 29,1920 in St. Vincent Hospital, Erie, PA.
Father Stanislaus Konieczny CM was the second rector until January 1926. During his tenure second and third floor were renovated by making a Study Hall and one large dormitory out of two distinct rooms opposite sides of the corridors. Additionally a $40,000 gymnasium-auditorium was built over the boiler room which was officially opened with and intramural basketball game on February 12, 1924. Father Michael Sadowski CM was his successor as third Rector. St. John Kanty was his first assignment after arriving to the United States in 1913. During his long stay at Kanty, he had experience in every available position. His first term in Erie ended in February 1929. Following him as Rector was Father Joseph Studzinski CM until 1934 when Fr. Michael Sadowski returned for his 2nd term of Rectorship until 1937. 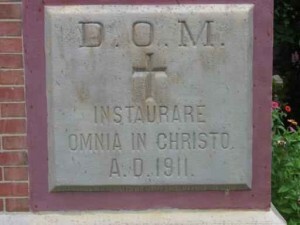 Father Louis Moska CM came in his place until October 1938. He was succeeded by Father Stephen Krol CM, who earlier was acting Rector of Kanty right after death of Fr. Glogowski, then returned to Poland and came back to New England. His term was short because of weak health and in 1943 he left the office. Again, for the third time Fr. Michael Sadowski was his successor. The ninth Rector of Kanty, for the first time, became its alumnus, enrolled as a student in 1925, Father John Lucian Janowski CM. He was appointed Rector in August 1947. Beacuse of terminal cancer he resigned in 1950. The next Rector was his coleague from Niagara University studies, Father Edward Gicewicz CM. Unfortunately, his tenure was broken by Korean War after eleven months. Fr. Ed was called on duty as military chaplain in Air Forces. Next, Father Casimir Kiczuk CM was appointed to this position in December 1950. Fr. Casimir was Kantian, too. When the WWII broke up he was in Krakow for theological studies. Succesfully, he escaped from Nazi occupied country and via Italy reached back United States. During his term a decision was taken to build new gymnasium. Its construction began before he left the office in September 1954. He was succeeded by Father Adam Minkiel CM, a graduate of Kanty Junior College. During his governance the school buildings went through extensive renovation and rearrangements because of re-evaluation by Middle States Association. In December 1957, Father Julian Szumilo CM was appointed another, thirteenth Rector. After four years, Father Waclaw Czapla CM was moved to his position in 1961. Succeeding Fr. Waclaw as Rector was Father James Mielechowski CM in 1964. Ordained a priest in 1936 he was assigned to Erie in 1937. His stay here has finished at the end of Rector’s term of office in January 1967. Later, after two years in Utica, Fr. “Jake” returned to Kanty Prep in August 1969 and left it when the community withdrew from there in September 1982. Father Chester Mrowka CM followed Fr. 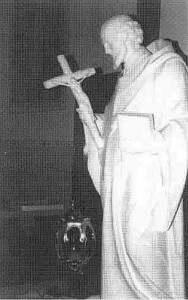 Mielechowski as Rector until 1976. In that time he was head of the committee for the erection of the new Province of New England (April 23, 1975). After Fr. Chet’s tenure the office of Rector in Erie was divided in to positions, one Superior of the community handed to Fr. John Sledziona CM and Principal. The latter one went to Father Ronald Wiktor CM. In 1978 superior’s office was again joined with the one of Principal. By that fact, Fr. Ron became last Rector of St. Jan Kanty Prep. Himself he was Kanty alumnus, class 1953. Returned here as teacher in 1967. On September 6, 1982 he was the last man to leave the place and turn off the lights. During the years, most of US born members of New England Province were involved in various periods of time in teaching and educational activity of St. John Kanty Prep. Among them still living are Fr. George Dabrowski CM, Fr. Edmund Gutowski CM, Fr. Anthony Kuzia CM, Fr. Joseph Lachowski CM, Fr. Stanley Staniszewski CM, Fr. Mitchell Wanat CM, Brother Joseph Zurowski CM. Additionally, Fr. Stanley Miekina CM and Fr. Joseph Szpilski CM were residents there involved in missions activity. The history of St. John Kanty Prep, Erie is the history of Vincentian presence and mission in North Eastern United States. There would not be present Province of New England if there had not been St. John Kanty Prep. In the 68 years of Kanty’s existence (192 – 1980) as highly rated and accredited, well known and important educational institution,of the alumni who pursued further professional education, there were 164 priests (38 of them Vincentians), 17 monsignori, three religious brothers, 34 dentists, 51 medical doctors. four osteopath physicians, 23 attorneys, three judges, five PhD’s, and six in the professional military service. The largerst enrollment in Kanty’s history took place in the last year of its existence , when 202 students were enrolled for 1979-1980 school year. In 68 years Kanty graduated 1,214 students with high school diplomas. Altogether, counting those who attended the high school for whatever length of time (955), and those who attended College only from 1928 – 1943 (65), there were 2,234 students passing through Kanty’s portals. For years St. John Kanty Prep boys were known for their prowess on athletic fields and courts, beating teams from bigger schools. Early in the March, 2010, the sad news spread. The East 38th Street building where hundreds of boys played, lived and learned would become a legend only and part of memories. Ken and Carolyn Lochbaum who has operated a physical-therapy clinic in Harborcreek Township site. A residential treatment facility for state prison inmates, Gateway Rehabilitation Center, opened there in 1999 and left in 2009 for a Millcreek Township location. The property was bought by Penn State Behrend for $922,405. 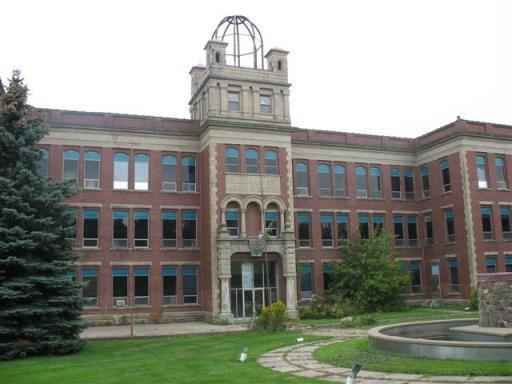 In the purchase contract demolition of the 2,000-square-foot building was part of the deal. 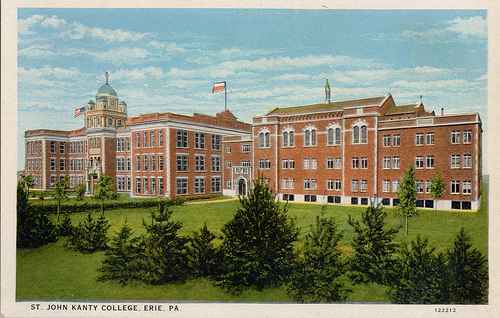 Although the Behrend College will not acquire the land until June 30, Lipchick Demolition of Erie entered the grounds in late March. Within six weeks their bulldozeers teared down the legendary building. Kanty grounds filed as college-related residential/commercial district zone. Behrend already owns 43 surrounding acres according to its officials. Mr. Mike Trott, class of ’77, recorded a unique chronicle (in 17 parts) of the progress of demolition. You can watch it here looking at legendary school building vanishing. “That definitely could change once we acquire the property,” Behrend spokeswoman Suzanne Scarpino said to Dana Massing of Erie Times News on March 16. The former Kanty Prep land includes 14 acres of undeveloped land and a roughly 10-acre parcel at 2860 East 38th St. with the old school building, Behrend officials said. In 2006, the Lochbaums donated famous 29 stained windows from the Kanty’s chapel to St. Joseph Catholic Church (Bread of Life Community) in Erie. According to Rev. Larry Richards, pastor, 21 of those windows were sold to a church in Florida as it was palnned. Funds have helped to pay for window restoration at St. Joseph. The other 8 will be used in Erie church after a time. Kanty Alumni, even after 30 years since last graduation, regularly meet at annual Reunions. This year’s one will take palce in Cleveland. They are very well organized and active, although living in all across the United States. Their webpage - kantyalumni.com – is collecting lots of memories, photographs, scanned documents to keep the Spirit and the Legend of the school alive. Pictures in this story are taken from their website). Coming down o the building is nothing, if the school continues to live in their hearts and their minds. Mr. Peter Rys, alumnus of 1979 (his brother Mark graduated in 1977) sadly noded, “I knew it was only a matter of time before it happened”. And next he wished he’d been able to take his 16, 14 and 12 years old boys, to watch games at his alma mater. He added, it’s really no consolation that Behrend might use the property for athletic and intramural fields, which is what initial plans called for. Another alumnus (1953), Mr. Arthur Oleszkowski, president of the alumni group, remembers students taking care of cows, pigs and corn at Kanty Prep. He added, that the four-year school had about 130 students in his times of whom 90 percent were Polish coming from around the country. In the talk with ETN reporter he concluded, that alumni are sad about the demolition but hope to save a small part of the building. “We definitely do want that cornerstone,” he said. Ken Lochbaum wasn’t opposed to handing the cornerstone out to them if they would pay for the work required to remove it and deliver it where they want it. Other parts from the building have already been preserved. Hey, yes, it was very sad to see the building go. More sad when I was the last freshman class there. I was so looking forward to the quality of education from there not available anywhere else. I’m not so certain I believe they closed it for financial reasons. I found it more probably that Prep wanted Mark and Mina. I think it really came down to parenets sending their boys there due to the best education possible. Last I heard, Mr. Cytuck was still teaching at Prep! LOL. There were so many memorable moments in his Algebra 1 Honors class. Including his story of how they drove the typing teacher nuts at Prep by bringing a Volks Wagon in the school and assembling it in the hall! Great school great people and great teachers. Not much more you can say except it was a great place! Excellent article on the history of St. John Kanty Prep. I am a 1976 alumni & just attended my first alumni reunion. 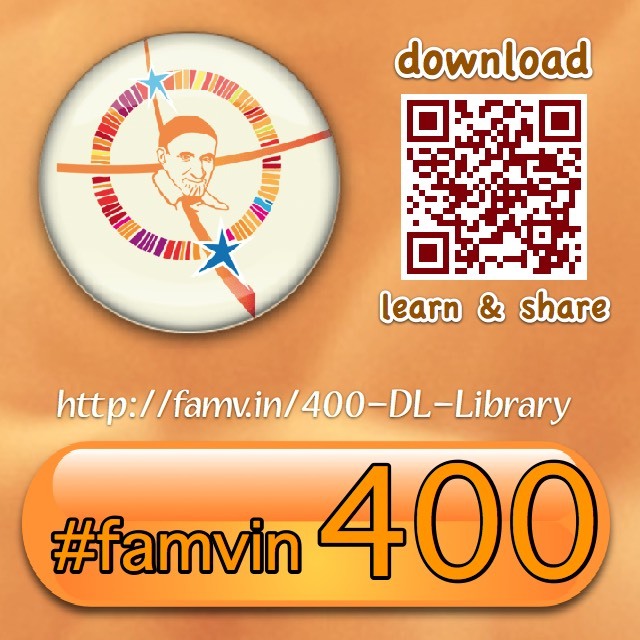 It was wonderful to meet the alumni of the 40′s, 50′s & 60′s & to see friends & alumni from the 70′s. My mom, Tessie Mszanowski, was instrmental in raising money for the school. Our whole family helped at many festivals and dinners. 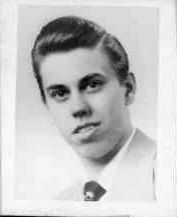 Our brother Francis Justin was a graduate in 1952 I think. I rememer the plays the boys put on on the little gym. I have kept contact with Fr. Joe Lachowski. He passed away Dec 20. It’s a shame there was no mention of the off-campus housing the Lochbaum’s provided for Behrend students in the late 1980′s-1990′s. There were quite a few of us that were not able to get housing on campus and this was the perfect alternative for us. There was a men and women’s wing- each with a couple dozen efficiency apartments that 2-3 students shared. I lived there for two years while attending Behrend and I am still close friends with several of the people I met while living at Kanty Village. Another great use of this historic building. I just saw Handsome Mike Trott. Remember who gave you that nickname? It was a great place to grow into being a man. Great sports teams I played on. I don’t see many friends since I live in Connecticut. Frank Polanski was and always will be one of my best friends.Never lost a fight when I was with him and Bryan Konkel. Norm Snider too.I will be visiting Erie this fall. I will leave my e-mail address. Hope to see some class of my 1978 alumni then.Go Mets! Anyone have information where previous transcripts are located. Odd as it might seem, I need to get a copy of mine 38 years after graduation. I was a member of the Kanty Class of 1952. Memories of Kanty are still very vivid. It was a very sad day when news of the permanent closing of the school were made known. Alumni in the Buffalo NY area still get together from time to time to reminisce. Sporadic contact with fellow alumni from around the country still goes on. Regrettably many of us old-timers have passed. Kanty has left an indelible spirit on those of us who were privileged to have been educated and guided by the Vincentian Fathers. It is good to hear that some of them whom I remember (Frs. Gutowski and Mrowka) are still with us. God bless all of you in the New England Province.